1. At the kiosk near the airport’s #1 and #2 bus stops, purchase a ticket for, and then board, the Komatsu Airport Limousine Bus bound for Kanazawa Station (¥1130). 2. Disembark at the last stop, Kanazawa Station’s Port Exit (formerly, West Exit). 3. Cross the station’s main hall to the Kenrokuen Exit (formerly, East Exit). 4. Take a local route bus or taxi from outside the station’s Kenrokuen Exit. 1. Buses traveling from the station to downtown Kohrinbo (香林坊) are frequent. 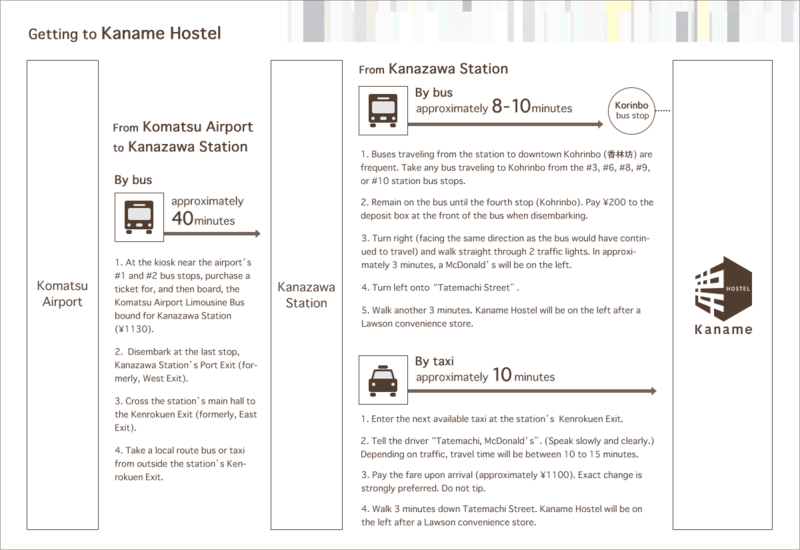 Take any bus traveling to Kohrinbo from the #3, #6, #8, #9, or #10 station bus stops. 2. Remain on the bus until the fourth stop (Kohrinbo). Pay ¥200 to the deposit box at the front of the bus when disembarking. 3. Turn right (facing the same direction as the bus would have continued to travel) and walk straight through 2 traffic lights. In approximately 3 minutes, a McDonald’s will be on the left. 4. Turn left onto“Tatemachi Street”. 5. Walk another 3 minutes. Kaname Hostel will be on the left after a Lawson convenience store. 1. Enter the next available taxi at the station’s Kenrokuen Exit. 2. Tell the driver “Tatemachi, McDonald’s”. (Speak slowly and clearly.) Depending on traffic, travel time will be between 10 to 15 minutes. 3. Pay the fare upon arrival (approximately ¥1100). Exact change is strongly preferred. Do not tip. 4. Walk 3 minutes down Tatemachi Street. Kaname Hostel will be on the left after a Lawson convenience store.